For those with previous experience of Traveller’s Tales’ ever popular LEGO formula, the core set-up will air a degree of familiarity. You’ll blast your way through four levels for each of the four films, and, as always, a sound knowledge of the source material is recommended to fully enjoy the experience. A series of cutscenes serve to bridge the story arc between each level, yet these are regrettably shorter than their console counterparts although employs terrific use of the Nintendo 3DS’ glasses-free stereoscopic 3D capabilities. 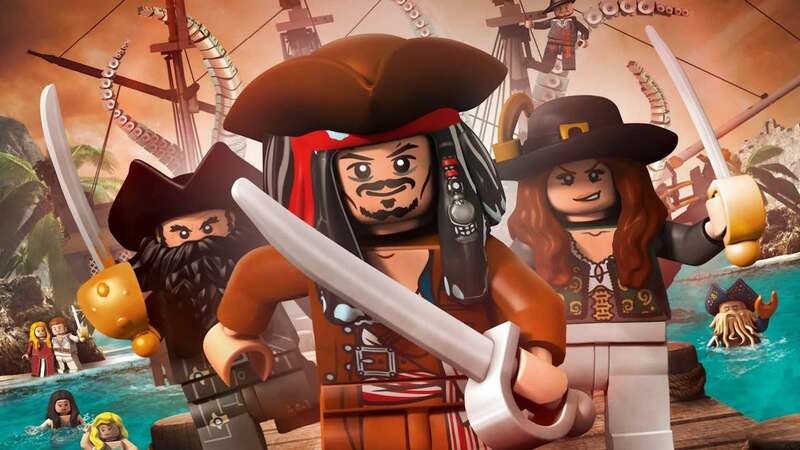 Along the way, you’ll encounter a blend of the familiar and not-so-familiar characters within the Pirates of the Caribbean universe, yet Johnny Depp’s masterful performance as Captain Jack Sparrow is faithfully recreated in LEGO form, complete with a humorous drunken swagger – too much rum again, clearly! Once again, characters each have specific skills that must be utilised to overcome certain obstacles during your continual adventure. Sword-wielding characters are able to activate levers, those with hammers can repair items, and those with dual swords can climb certain walls. 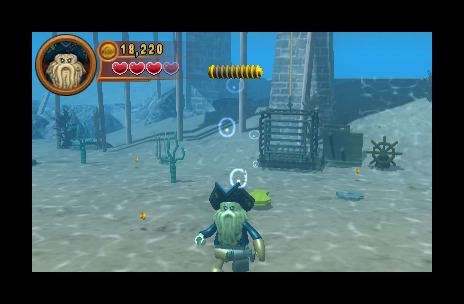 Captain Jack is also able to make use of his compass that directs him, via the use of an on-screen pointer, towards nearby buried treasure whose discovery aids level progression. Animals, including Dogs and Parrots, also make an appearance during the occasional section – able to pass through small openings to collect items. Visuals are notably crisp making the game one of the best looking titles on the handheld. However, levels do feel more barren than those experienced within the console version, and lighting, particularly, doesn’t seem especially varied. The Nintendo 3DS version also gets a few unique aspects of its own too including Duels, which serve as boss battles within the handheld iteration. These see you mashing B to build a meter before you must respond to on-screen button prompts to knock a Heart Piece off your opponent. They work particularly well, but cropping up within each film I would’ve hoped for a little more variation. In terms of control scheme, both the Circle and Control Pad are used for movement, with A utilised to interact with items or use a special ability such as Jack’s compass. B is for Jump, X is your Ranged Attack (Pistols and such like!) and Y is used for your main attack (usually swords). The L and R Buttons are used to cycle between available characters – visible on a spherical display on the touch screen. Disappointingly, you’ll be able to finish each of the story levels in around four hours, with each taking an approximate 15-20 minutes to complete. However, as per the norm, it is the post-conclusion temptation to revisit each in Free Play mode to hunt out each Red Brick, Ship Bottle and Treasure Item that will offer the majority plenty of replayability – easily doubling such length. Between levels, you are able to freely return to the Port, which acts as the central hub world for the game. 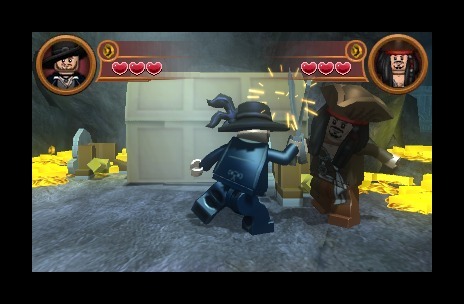 Here, you’ll find access to a Tavern, where you may spend LEGO studs to purchase characters, Red Brick Extras and Hints alongside watching previously viewed story sequences. Additionally, there is a Tailor’s Shop, that allows you to create custom characters for use in Free Play mode, and a Souvenir Shop in which you can view Ship Bottles that you have collected. StreetPass functionality is also far better implemented than that seen within LEGO Star Wars III: The Clone Wars, with players now able to engage in “Pirate Duels” with others that own the game that they pass. You’ll set three attacks and three blocks – ranging from Low, Medium and High – that are then performed when you battle another player, with the victor being the one that takes the least damage. From this, you will be able to earn Play Coins that may be used to unlock characters for use within the StreetPass mode – the most expensive being Blackbeard for 20 Play Coins. In addition, those that are victorious will also be able to gain experience that will allow them to rank up, providing the opportunity to unlock extra health, new moves, titles and characters. 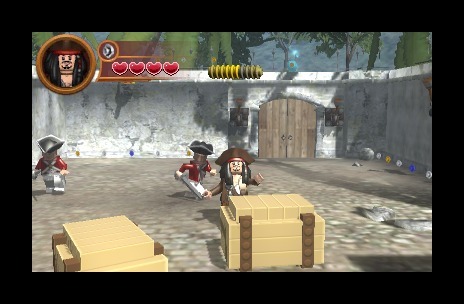 LEGO Pirates of the Caribbean: The Video Game faithfully captures the spirit of the films, and provides a LEGO adventure that becomes a worthy addition to the series. Whilst providing an enjoyable experience, the fact that it isn’t pushed far beyond the same formula that we’ve seen countless times before now ultimately holds it back. However, despite its short length, this offers something that Pirates of the Caribbean fans certainly can’t miss out on.